When Rowan Isaacson was diagnosed with autism in 2004 at the age of 2½, it seemed for his parents that his soul had been taken away. Their once charming, animated child stopped speaking, retreated into himself for hours at a time and screamed inconsolably for no apparent reason. Rowan’s parents, Rupert Isaacson, a human rights worker, author and former professional horse trainer, and Kristin Neff, a psychology professor, sought out the best medical care for him. But orthodox therapies had little effect. Then one day Rowan ran away from his father, got through the fence of their neighbour’s horse pasture, and in amongst the hooves of the horse herd. The herd’s boss horse, a notoriously grumpy old mare named Betsy, pushed the other horses away, bent her head to Rowan, and began to lick and chew with her lips: the equine sign of submission. So Isaacson began to ride with Rowan on Betsy every day, which led to him wondering if there was a place on the planet that combined horses and healing. He did some research: the country where the horse was first domesticated, where the nomadic horse life is still lived by most of its people, is also the one country where shamanism is the state religion, Mongolia. 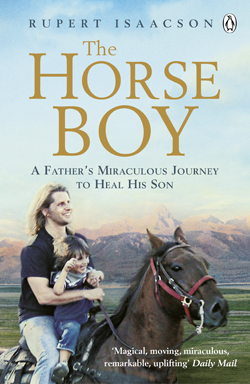 The Horse Boy follows the remarkable journey of Rupert, Kristin and Rowan through the summer of 2007 as they crossed Mongolia on horseback from shaman to shaman. The documentary includes comments from various specialists on autism as well as the tale of the difficulties and triumphs of the journey itself. Highly recommended, this heart-warming story, available as a book and DVD documentary, is well worth reading/watching, not just for its interesting portrayal of traditional Mongolian shamanic practice and for its educational value on the subject of autism, but because it is also an entertaining inspirational story of hope related with complete honesty and a great sense of humour.